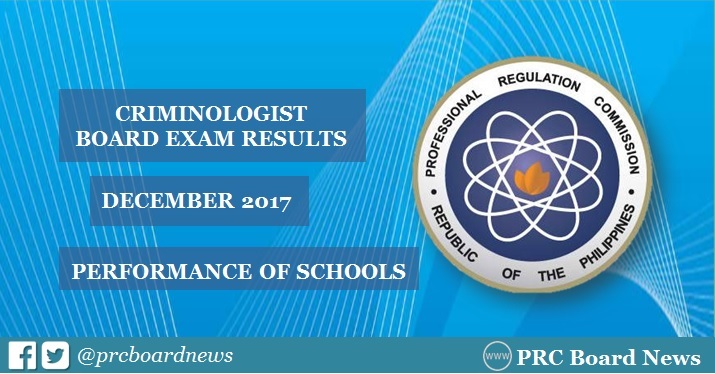 MANILA, Philippines - The Professional Regulation Commission (PRC) recognizes the top performing schools in the December 2017 Criminologist licensure examination (CLE) or Criminology board exam. The result was released on Friday, January 12, 2018 or in twenty-one (21) working days after the exam. Tarlac State University (TSU) dominated the schools with 98.21% or 55 out of 56 passed the exams. This time, University of the Cordilleras (UC) ranked second with 96.77% or 60 out of 62 successfully hurdled the tests. PRC administered the CLE on December 8, 9 and 10 (Friday to Sunday) in Manila, All Regional Offices; Zamboanga, General Santos and Rosales, Pangasinan. University of the Cordilleras (UC) dominated the Criminologist licensure exam in the past years. In the October 2015 and 2016 exams, UC topped the schools with 94.20% and 95.16%, respectively. King's College of the Philippines Inc. - Benguet, Tarlac State University (TSU), Ifugao State University (ISU) and Data Center College of the Philippines - Laoag City are among the top shools in the October 2016 exams. The topic for the essay is amazing and lots of information can be found on medical school personal statement example online. For best results, you can always add your own thoughts. Spas is some sort of the excellent parlor numerous women go there to make the diverse kind of design there are face spoiling sustenance. The confronted clean and the face rub are truly dependable in spas excellence parlor the site portray the Follow this link guidance to make their wellbeing magnificence. Criminologist board exam result is now announce. If you want to take this result then you must open our weblink. Then you can easily manage and take it. And also refer others to come and check there result. Explicit course is giving a basic degree of chances of landing positions which is valuable for the welfare of the general people. Endeavors follow the link continue running with the help of prepared people. Openings for work are unfathomably fundamental for the young people to make society quiet. Physical bearing is one the most basic bit of preparing as you have moreover said it in your beneficial and best article that physical arranging https://www.phdstatementofpurpose.com/free-sample-sop-for-phd/ can be to an unprecedented degree obliging to discard risky issue and to bring the smile back on people's appearances.